The International Journal of Contemporary Tourism Research (IJCTR) is an open access, blind peer-reviewed international journal published in English and Turkish. It aims publishing high quality research studies in all related areas of tourism, including economics, business, management, history, geography, sociology, social psychology, ethics, etc. ULAKBİM Note: ULAKBİM TR Index will include internationally recognized author identifier ID information. Since ORCID will be used in joint studies to be carried out in cooperation with YÖK, it is recommended that the journals that apply for or take part in the TR Index, request ORCID information from the authors and include this information in the journal (s). Therefore, the authors are required to obtain individual ORCID numbers from http://orcid.org free of charge and the ORCID number received must be registered on the dergipark system (1 time) via dergipark, entering the user's profile arrangement. As of 2019, the author will be given the ORCID number in the journal. 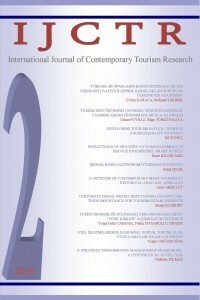 IJCTR isimli yazarın International Journal of Contemporary Tourism Research başlıklı eseri bu Creative Commons Atıf-AynıLisanslaPaylaş 4.0 Uluslararası Lisansı ile lisanslanmıştır. http://dergipark.gov.tr/ijctr bağlantısındaki esere dayalı olarak. Bu lisansın kapsamı dışındaki izinler http://dergipark.gov.tr/ijctr adresinde mevcut olabilir.